Poor Students At Top Colleges Still Feel Unwelcome, New Book Says Many elite colleges have committed to enrolling more low-income students. But, a new book argues, their efforts at inclusivity still fall short. 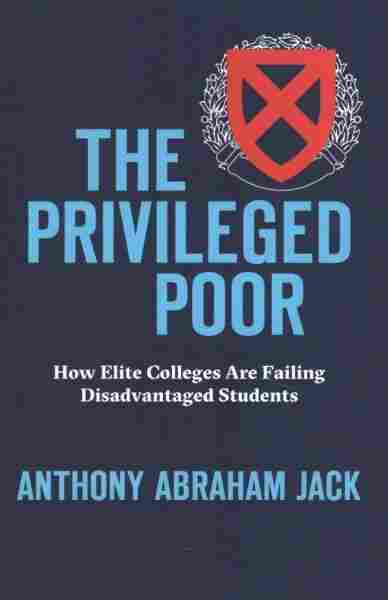 "There's a difference between access and inclusion," explains Jack, an assistant professor at the Harvard Graduate School of Education and author of the new book The Privileged Poor: How Elite Colleges Are Failing Disadvantaged Students. "Universities have extended invitations to more and more diverse sets of students but have not changed their ways to adapt to who is on campus." 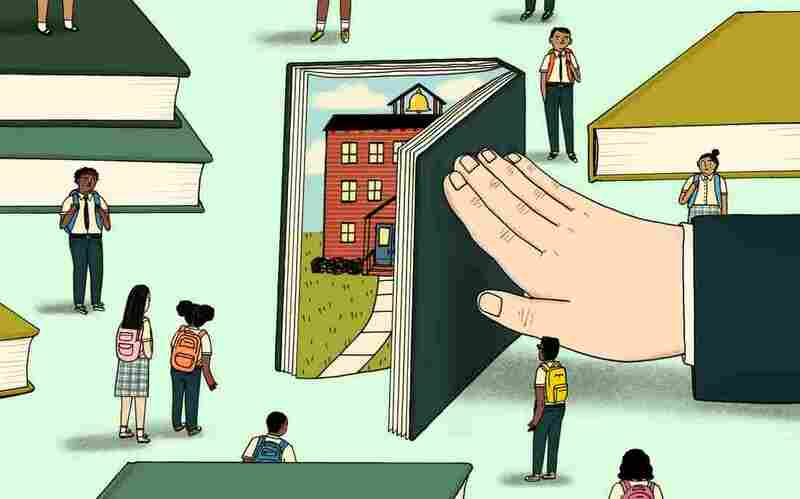 For his book, Jack profiles low-income students at an unnamed elite college. He puts them into two groups: Those coming from prep schools, and those coming from under-resourced public schools. In those two groups, he finds key differences but one common problem: "We have paid less attention to what happens when students get on campus than their moment of entry and where they go once they graduate." Fixing the problem, he argues, means creative and thoughtful solutions, such as keeping dining halls and dorms open during holiday breaks — because not every student can afford a ski trip, or even a bus ticket home. I spoke with Jack recently about his ideas for improving life — and outcomes — for these students. Our conversation has been edited for length and clarity. Back in 2015, you wrote an opinion piece about how elite schools were recruiting low-income students from elite prep schools. You called those students the "privileged poor," which is now the title of your new book. How did that come to be? I was a Head Start kid who went to public school up to 11th grade, and my senior year was an anomaly in a private school. I thought my senior year was just a detour; a one-off. But when I got to Amherst College, turns out that prep school was an HOV lane for poor students. A lot of my classmates were poor like me, but they went to Andover and Exeter, Saint Paul and Choate. All of these boarding schools that I had never heard of. They were talking about studying abroad for their junior year to learn the language. They were talking about snow-tubing trips that the school paid for. In graduate school, we started reading a lot of the sociology of education, and I didn't see my classmates in the literature. Your research shows that those students have a different experience on campus than low-income students coming from underserved public schools. Can you explain? There are two groups of low-income students on campus, and they have two sets of experiences. I've termed them the doubly disadvantaged and the privileged poor. The biggest difference between the two, according to how students told their stories, is: one group felt more at home, and the other felt culture shock. The privileged poor, the students who went to the private schools, they knew the hidden curriculum, the hidden rules that govern these places. They felt more comfortable, and they directed themselves in a way that was more similar to their middle-class peers. The doubly disadvantaged, they felt out of place and experienced that culture shock and isolation. So the doubly disadvantaged are low-income students who don't have this institutional knowledge. How does that manifest? We have been teaching students from more privileged backgrounds for so long, that we take a lot for granted on a college campus. Mental health offices, career service offices, they are so used to students being more proactive and entering their doors because they've been taught that if you want something, you go out and get it. The fact that you have to go seek things out, that's an unspoken rule on a college campus that disproportionately hurts low-income students from disadvantaged high schools. There is a bias towards privilege on a college campus that permeates so many things that we do. The folks making policy in higher education tend to be folks where the system worked for them. Your book seems to push readers to try and change their perspective. I hope that anyone who reads this book asks one important question: What else do I take for granted? The big thing I uncover in the book is the hidden curriculum that operates on the college campus. On the academic side, how does one engage with different faculty members? The expectation is that students are the ones who are proactive, and yet we use terms like office hours. Professors often say when office hours are, but never what they are. Only a certain segment of the population has ever heard the term, let alone had the opportunity to master what skills you need to make the most use out of office hours. It's not just what students know that we take for granted; it's also what they can afford. Spring break is a perfect example. "Oh, spring break! You're going to go home or you're going to have some fun in the sun!" Often times, that's actually not the case. For a lot of our students, home is not necessarily the place you want to go. Universities are actually saying, "Come here. Money will not be a barrier to your entry or what you want to do." That is what these colleges are saying, but what's actually happening is, when students get on campus, they realize just how the social undercurrents of this place, and the official policies of the place, make them feel like second-class citizens in a first-class world. It has implications not just for your GPA and retention, but also for your use of resources on campus. It's about who feels comfortable going into the career service office to get help with the résumé, who feels comfortable getting help with a mental health diagnosis, who feels comfortable doing all those little small things that are the foundation for one's future when you leave college. As colleges recruit more low-income students, there have been efforts to integrate these students into campus life. In your book, you talk about how some of those initiatives are well-intentioned but sometimes do more harm than good. Can you give me an example? At the school that I study, there was a program that gave students free tickets to events. That's actually a good thing because those extra university events can quickly add up over the course of a semester. The school decided to protect low-income students from being viewed as getting a scholarship ticket, so they created a separate line to pick up tickets for those who are on scholarship. How that ultimately plays out in public is that a whole bunch of white and Asian students are in the paying line, and then on the opposite end of the room, you have a line of people who are picking up the free tickets. That line is mostly black and Latino with Asian and white students sprinkled in. It becomes the opposite of invisible; it becomes highlighted. You are literally separate from your peers. You can't help but think about the Jim Crow South. Those kinds of policies undercut moments where students feel they are full members of the community. It cuts at the trust that students have not just with the institution, but with the people who are in positions to help them. There are about 20 million students going to college today — and only a very small percentage of them go to an elite school, like Harvard or Yale. So why should we care about what happens on those campuses? A lot of things that I study happen at all schools. The miscommunication between faculty and students has been documented across higher education, at community colleges and four-year schools. I tried to remove all of the things that we know hurt students' integration into college, like living off campus, commuting and working. I'm showing you that even at a place like this, even under the best of conditions, higher education still privileges a narrow set of experiences that are more likely to be held by those of middle-class and upper-middle-class families. If I'm able to show that food insecurity exists at schools like Yale, Harvard, Penn and Princeton, how then do you think it manifests itself at the University of Wisconsin or at Texas Tech, or at the regional college? Yes, I study the elites. But more importantly, I study how poverty and inequality shape how students make it to higher education, and how they move through it. So if the privileged poor are more comfortable and prepared for college, might that be a solution? Especially considering the Education Department's push to increase school choice and allow public dollars to be spent on private schools. Putting students in private schools is not a social policy; it's an abdication of responsibility. Social policy would be trying to figure out how do we get our underserved K-12 schools to be able to compete, not just with their suburban counterparts, but what if they aspired to be something greater. What would happen if our public schools actually looked more like some of the private schools that we know have a ton of resources? One thing this book actually shows is that when you give low-income students the resources and the experiences of those from more affluent backgrounds, they enter college with the skillset and the orientations to navigate the place successfully. They take advantage of the resources that are available. It shows that the privileged poor is what happens when you are actually given a shot to succeed and not just a whole bunch of extra weight to hold you down as you try to climb up the ladder that is the American dream. But, I think just sending students to a private school is not scalable, and we're not actually helping all the students that we are here to help. So the book is about college, but not really? The university is just my site to study something greater. This book is about poverty and inequality. I'm just bringing it to higher education. As universities diversify their campuses, their connections to neighborhoods that previously were overlooked — low-income communities, predominantly minority communities, predominantly immigrant communities, and rural communities — all of those connections become stronger and stronger. And we need to understand how poverty and inequality work, not just to understand a student's education trajectory, but also to understand what can we do for the students who do make it to these schools.